« Army blanket pillows, swords into ploughshares. A ketchup bottle on the stereo speaker really completes this. Maybe this is Sixties Baroque. Ketchup aside, the wall-mounted amp is cool, and the wall painted in four colour blocks is clever. 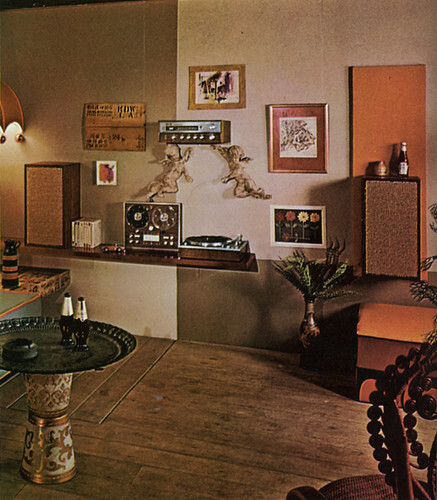 Photo is from The Practical Encyclopedia of Good Decorating and Home Improvement, Greystone Press, 1970. Click here to see the whole page with original caption. This set of encyclopedias is an incredible source for retro DIY ideas and often far-fetched photos that I haven’t seen anywhere else. You can get a whole set of these encyclopedias for yourself on abebooks. This entry was posted on Saturday, January 10th, 2009 at 5:55 pm	and is filed under design. You can follow any responses to this entry through the RSS 2.0 feed. You can leave a response, or trackback from your own site.